Things are returning back to normal around here since our European vacation. This week I hope to show you our lucite kitchen pulls that I posted about here . I plan to FINALLY order the blinds for the master bathroom and possibly even paint the bathroom doors. I want to reveal my closet that I posted about here . I would like to show you our completed concrete squares drive way which I originally posted about here and here . I would also like to post a couple sneak peeks on one of my projects. In theory this will happen, in reality I will do the best I can I promise!!! 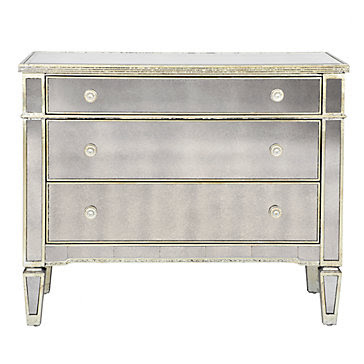 Today I want to talk about what I have my eyes on next, mirrored night stands. 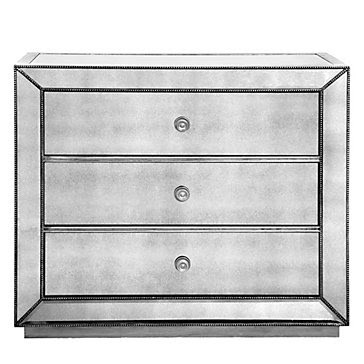 More specifically mirrored dressers as a night stand. In our storage deprived master bedroom (as a reminder it used to be the garage) I love the idea of using 2 chests of drawers as the night stands. The scale of them would work well in our space and our bed can definitely support the bulk. I also love the idea of having 2 full chests to store the extras what ever they may be. Take a look at some mirrored options and see what you think. Though some of these spaces are a bit too romantic for my taste, you can take this versatile furniture style any way you want. 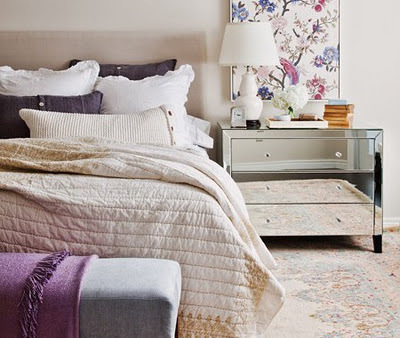 For me I would make it more modern and clean as opposed to romantic and traditional, but that's just me! Here are some "affordable" options that I have my eyes on. 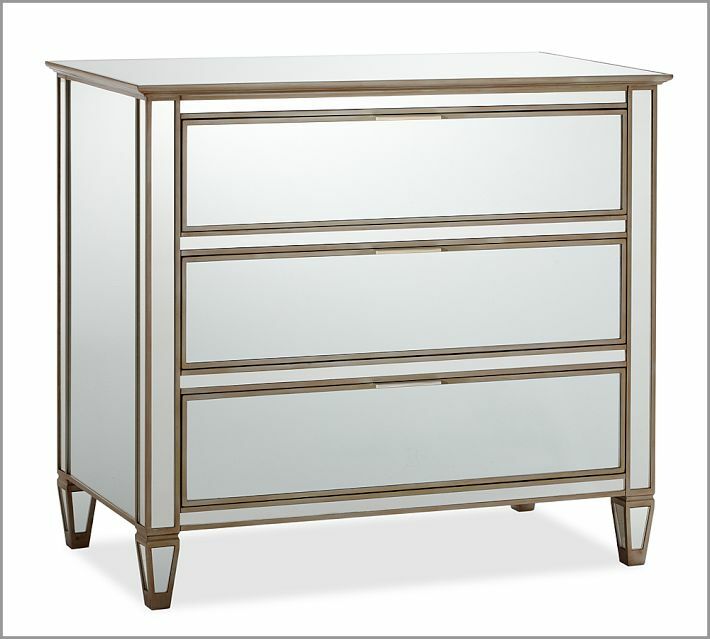 Simplicity Mirrored 5 Drawer Hall Chest $899 as a clean all mirrored modern option (one of my favorites. For me this isn't something that will happen soon (hello expensive summer vacation! 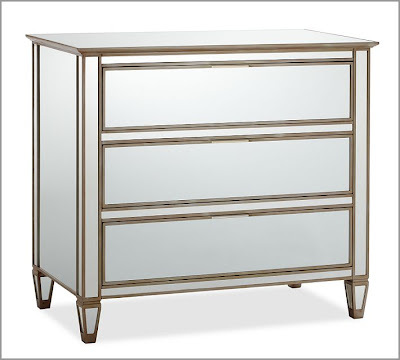 ), but one day in the future I WILL have myself 2 mirrored hall chests/dressers/night stands to call my own. What do you think? 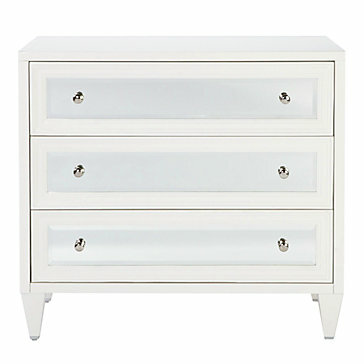 Would you want to use a substantial dresser as your night stand or do you prefer something small and non obtrusive? Do mirrors make your heart sing, or are you worried about keeping them clean? My first choice is Simplicity Mirrored 5 Drawer Hall Chest. I like the small drawer which it is easier to pull out especially when you are looking for something at night. More functional, simple and modern look compared to the rest. 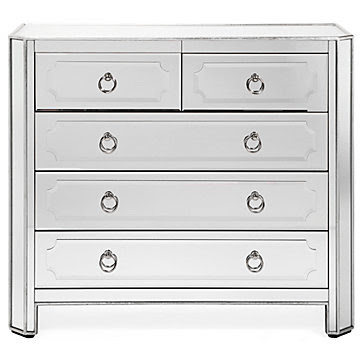 Second choice is Concerto 3 Drawer Chest which it will be too girly and romantic style. With the white trim you will have difficulty to match for the rest of the room...well it is really depend your decor theme. I love the simplicity line too (I put the biffet in a client's home). I also lean towards modern styles in general. I also love the concerto but wasn't sure about the white trim. Hi! I came to your blog by accident! 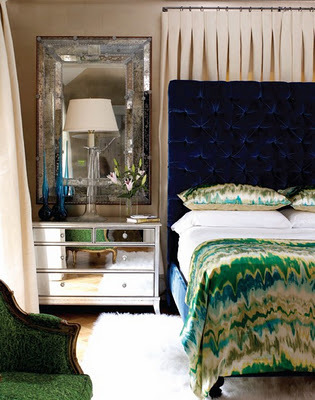 I would love to have a mirrored piece of furniture. Did you know that Ikea has now a mirrored MALM? That would be inexpensive option. Thanks Johanna, I haven't been to Ikea for a little bit and haven't seen their new items. I'm DEFINITELY going to check the new MALM out!!!! Love the tip! Could you give some information on the first photo? I love the curtains and hardware that is used for the canopy. I'm sorry that I don't have the original source for you on these images. They are ones that I've saved a long time ago. My suggestion if you are after a bed of this type is to look for a bed with a canopy frame. Too bad they don't sell the Edland bed at Ikea any more! 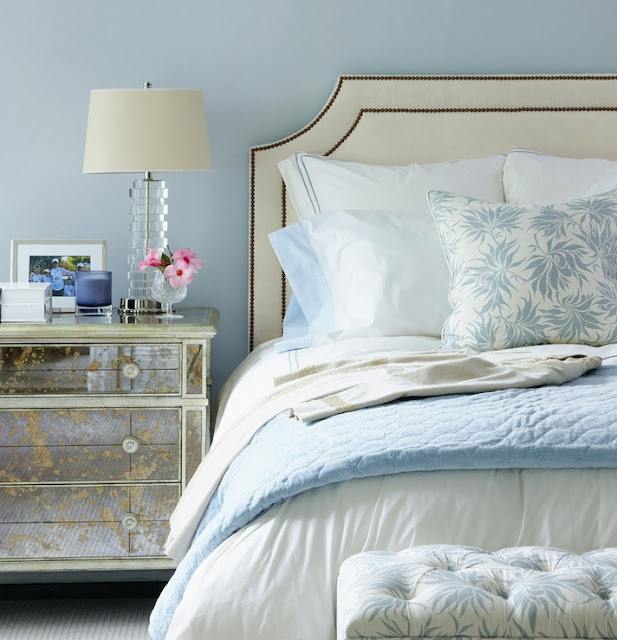 Maybe I can do a post on canopy beds and see what I come up with. The other way you can achieve this look would be suspending your frame to the ceiling through mounting curtain rods on your actual ceiling. 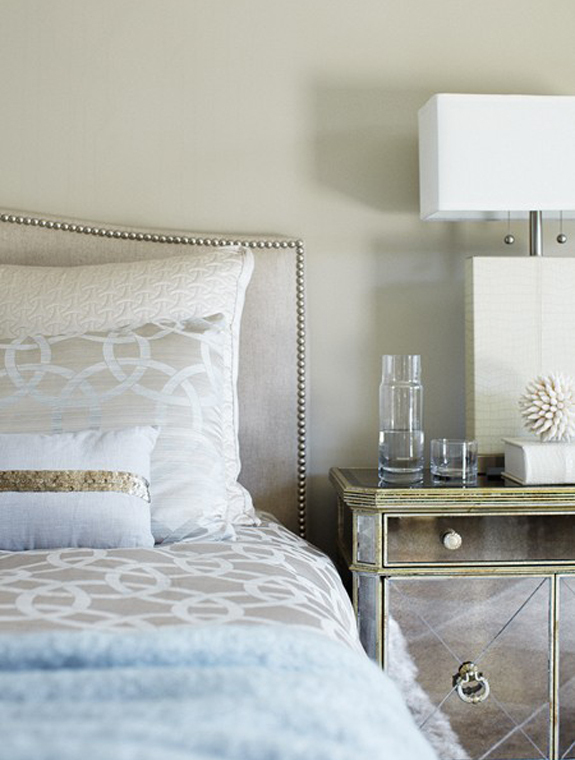 The rest is simply selecting curtains long enough to drape to the floor. I love this look too! What a dreamy way to wake up every morning.